Executive coaching - Business Growth Coaching - Leadership & Management Development Training. It was deeply insightful and provided invaluable help to the way our company is run and how we are going to proceed actioning projects. "I have been very fortunate to worked with Martin within my role at SMP Group. Martin passionately sets and drives clear strategy and vision while being adaptable to my needs. Martin really understands the needs of his clients and how to support them and get the best out of them. It is these qualities that make Martin an excellent Coach. I often use parts of Martin's coaching in both personal and business situations that have made a big impact for me! Martins training technique and his personality are an inspiration to me. He gets his message across very efficiently and tailors his approach to each individual. Over the 2 days, Martin’s Presentation Skills training carefully developed and nurtured an atmosphere where the whole team were confident presenting to an audience, providing us with tips and tricks to maximize the delivery of our presentations, building up confidence and always sharing his expertise. The training notes which accompany the day are detailed and interesting and great to refer back to. I would highly recommend Martin for his depth of knowledge and development skills but more importantly for his fun and engaging style of training." ​"The workshop provided valuable time and resources to evaluate our current practices and consider new and more effective ways of moving our business forward." "Martin's support has proven invaluable from just a handful of sessions. He is able to cut through to the core issues and to find empowering ways of dealing with difficulty and conflict." ​"The course content was excellent. Almost as though it was aimed straight at me! It was well worth the effort and I would heartily recommend." "Having just completed a course of coaching sessions with Martin Johnson my company has taken on a completely different shape. 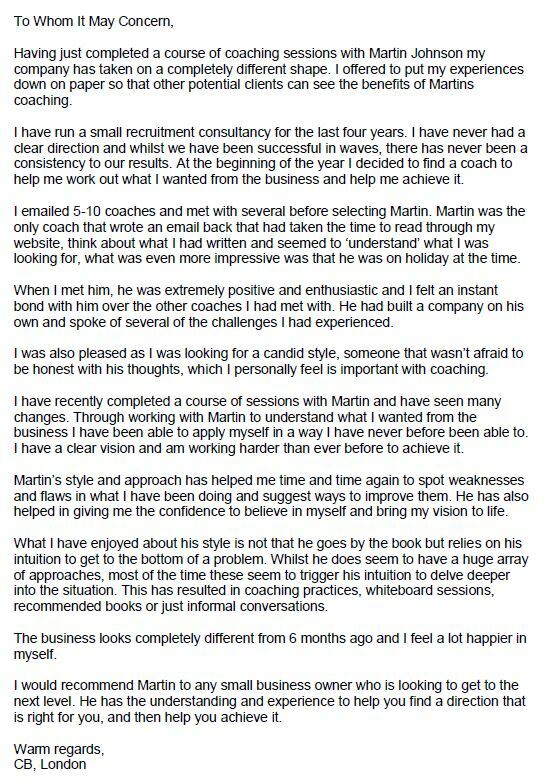 I offered to put my experiences down on paper so that other potential clients can see the benefits of Martin's coaching...."
"I have worked with Martin now for a number of years. Through his work as a Management Coach, he brings a clarity on setting business goals and achieving targets. The best testament to his input is that we have seen improved performance across all the team." ​D Jenkins, Director, ECD Architects Ltd.
"I would like to thoroughly recommend Martin for the business coaching that he has conducted for me at Neos Creative Ltd. He has taken the three owners, worked with them to create a direction, maintained momentum and has fundamentally changed the company in a massively positive way. Actually, I cannot thank Martin enough as he has never told us what to do, only helped us articulate and action what we already know and the results have been off the scale!" "Martin was hired by my company to coach me in management development and strengthen my role as Head of Post-Production. Thanks to Martin's unique approach to training and his pertinent questions during our sessions together, I have learnt so much about myself (self-awareness) and gained new excellent practical steps to becoming the most efficient manager I can be. Thank you Martin and 80/20 Challenge Ltd for everything. " "Running a small successful business was easy. Taking it to the next level, managing staff and maintaining focus is where Martin stepped in. Martin has taught me key insights that have enabled me to understand how to manage difficult situations, support staff and ensure a constant high morale in the office. Without his guidance I would be struggling to cope with what I now see as simple situations. Martins guidance is building on what you already know, it just you don't realise you know it.."
"Thank you for today's session. I thought I knew what I wanted, but in our short time together, I learnt so much. My priorities are so clear, and they would not have been, had it not been for your thought provoking insights.... And you made it so conversational and painless. Thank you so much, and I look forward to working with you for a long time." ​"I used Martin as a Business Management Coach and did the 80/20 Challenge. He was a bit of a mentor to me, in helping me develop my business, improve upon my management skills and as a sounding board for my thoughts about furthering the business. I found his help and advice extremely useful both during this process, and as my business has continued to grow since then, I believe that his input and feed back has played a huge roll in helping me realise this." "Martin’s coaching has proven invaluable in helping us take a step back from the day to day, address issues and any blind-spots and have more clarity on our goals. Coaching is allowing us to move forward more quickly and strategically, be more accountable and measure the results we are achieving. Martin's approach is very flexible and focused on us; he uses a range of skills including positive challenge and insightful questions, creative brainstorming and insights based on his own business experience." "In just three sessions Martin was able to show us the bigger picture for our company and, working with us, able to put together a strategy for moving forward to attain it. We would definitely use him again in the future"
Ben. Owner of London cafe chain. What I enjoyed was that from the beginning I trusted him and his ability to use appropriate methodology of his immense portfolio in order to bring issues to the surface and deal with them successfully. His professional guidance and tools helped me to work on a new career progression and I would happily recommend him at any time." "I just wanted to write this note to thank you for all the work you did with me for the last 7 sessions and to let you know that I have learned so much from you about understanding different ways of communication styles and behavioural flexibilities. I have achieved a lot in terms of my personal development and for that I am truly grateful to you. I hope we can use your expertise in the future because you have so much to offer." “I think we all felt that yesterday was the best session so far. To some degree it's because the timeframe we discussed is already upon us, which meant that we were discussing specific and immediate actions rather than stuff that is in the future, so we could relate easily to everything and our roles in achieving these goals. “Fantastic! Makes you think and realise that you can do it! Learnt new processes - good knowledge.... Very good training strategies!. Thanks." "An extremely interesting and hugely enjoyable course. I will be able to apply all that I have learnt in my job. There were times when I felt there were life changing moments. I would recommend this course highly. Martin is a brilliant trainer." Margaret, PA to Chief Executive. "I encountered Martin while working at NeosCreative. I attended one of his 3 day NLP at Work Training courses and can honestly say it changed my life. I cannot recommend Martin highly enough. Through him I have found great strength, courage and insight and am a happier person for it." "The workshop was excellent. Martin is really knowledgeable and engaging. Thank you." "The lessons learnt were practical and could be used immediately. Within a few days I could see the change in effectiveness of myself and of my team." "The course was extremely useful. I've been putting all skills and experience into practice and above all I feel very confident. Two days course that changed my life - thank you!" "If you really want to learn useful tools, that will not only help you grow in your career but assist in you doing your job more efficiently, then Martin is your man! Whatever your career, he can improve your approach, provide you tools to empower yourself and make life better." “The pace of the workshop and structure was very good. I have learnt a lot about myself and the way I currently work and how I can adapt to be more productive and happier in my working life." "...the workshop offers easy-to-use and easy-to-understand concepts for ensuring profit generation is always included in the decision-making process. When running businesses it’s easy to forget that all decisions, big and small, impact on the bottom line and the workshop puts this across very effectively." “Course exceeded expectations as I feel it has inspired me to make a real change in how I feel about myself and the potential that I have to succeed in both my personal and work life." “Excellent course, excellent tutor, highly recommended"
“Lots to think about and take away with me. Martin was great in allowing us to describe our own experiences and showing us how to put the theory into practise. You can see Martin is passionate about what he does and this makes the course more interesting"
“The course was not only covering excellent materials and helped me a great deal to sharpen the focus on key areas. Also, helped to refresh existing knowledge, very strong focus on the areas I need to improve and will most definitely recommend the course to colleagues and friends". “Excellent course - its always worth investing time in yourself"
M.D. International Trade Centre, Geneva. “Very useful course. Spent two days learning useful things that can be easily put into practise. Thank you!" D.N. International Trade Centre, Geneva. “Very enriching training course, learning how to be an effective person in life. Learn more about yourself and the the psychological aspect is important. I personally learnt that I can achieve any goal as long as I believe in myself". T. Al Ahbabi. Aspire Academy, Qatar. “The course has been very informative and helpful and I will certainly recommend..."
“Informative and knowledgeable. It was good to be able to participate." “The course equipped me with the belief and confidence that I can achieve my aspirations and gave me the tools to enable me to succeed.” The trainer was “very personable and motivational”. Enabling individuals, teams and organisations to achieve greater confidence, performance, skills and balance in what they do and how they do it; increasing growth, profits and results.